There are a lot of things to love about the South: the warm hospitality, the sumptuous food (mostly of the fried variety! ), the grand architecture, charming rocking chairs everywhere you look, and the exotic wildlife. And then there are the things I could do without: the oppressive heat coupled with intense humidity and the bugs that are so abundant they make an audible humming that's hard to ignore. Last week my husband and I visited family in South Carolina and we were able to experience the good, bad and ugly of the South, as mentioned above. 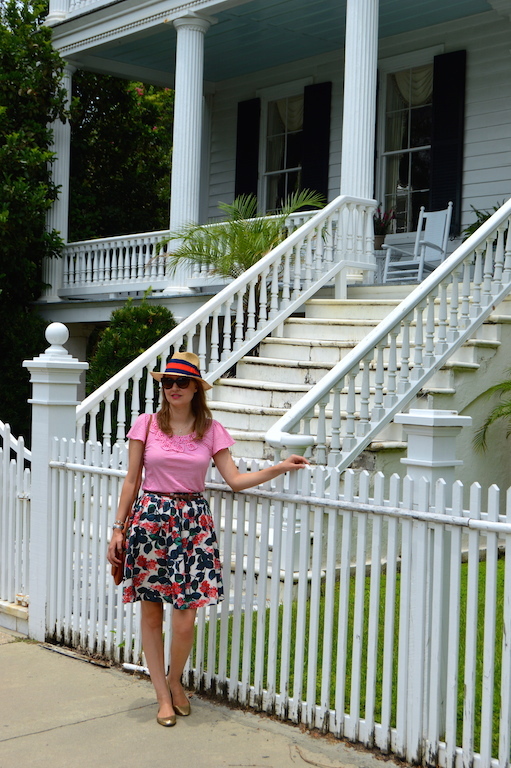 To the extensive community of Southern bloggers, I give you props. Taking pictures in 60% humidity and 95 degree temps? Now that takes guts and stamina! As you can see, I am mainly fixating on the abysmal weather (oh, I forgot to mention the freak thunder storms that strike without warning! ), but overall it was a wonderful trip. We were able to see everything from a kazoo factory, to historic homes, to wildlife sanctuaries. 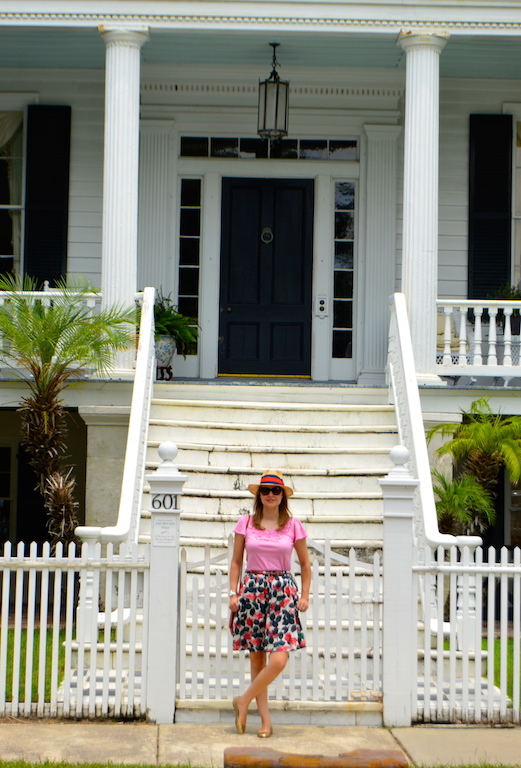 The pictures below were taken in the city of Beaufort, which is where the aforementioned kazoo factory is located, not to mention a bevy of historical homes that would make any southern belle swoon. In addition to learning about unexpected things and soaking up the history, the outlet shopping in South Carolina is glorious! I picked up the hat above from a Saks Off 5th. It was only $24 (minus a little extra thanks to a coupon) and made in Italy. I wore it for the duration of the trip. My suitcase definitely weighed a lot more on the return trip than it did going. Over the next week or so I will be posting some more photos of my journey to the South, including some of my outfits (I packed using a very particular color scheme of red, white, blue and lots of stripes so that everything would match), my outlet finds, and, most importantly, my highlights from the trip. 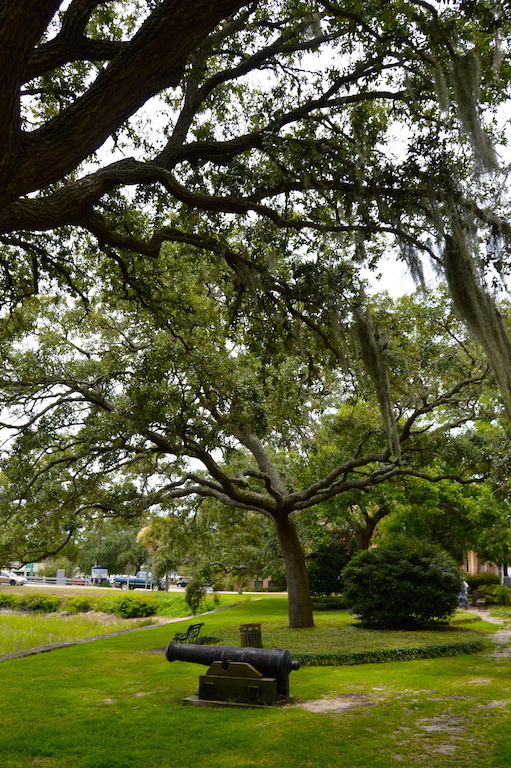 For right now, sit back, enjoy a mint julep in your rocking chair and enjoy these photos of Beaufort and me! Thank you Susan! The location really was quite beautiful and the perfect place to take pictures! head to toe perfect! love this summery look! Thanks Irene! I love this skirt because it's perfect for summer, but also works well in fall due to the color scheme. I love the print and color combination here! Such a fun and vibrant look! Thank you! For my trip I packed everything in this color scheme to make travel easy! Hello Beautiful Southern Belle. 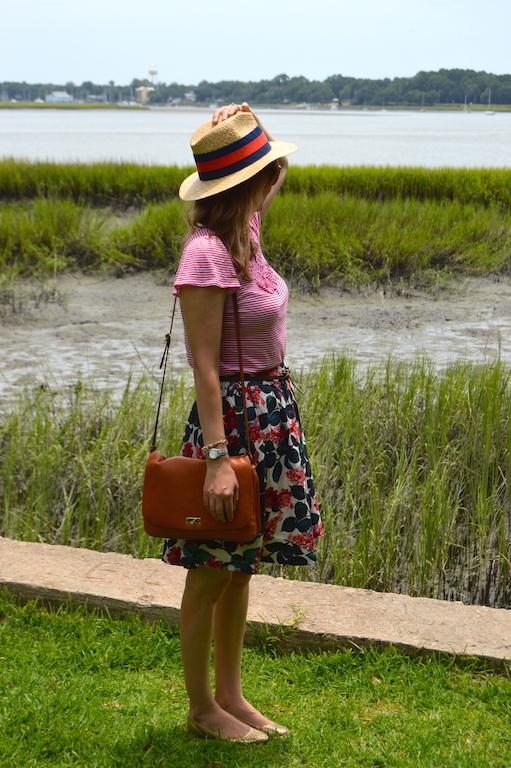 Indeed Southern-pretty in your florals, red and greens. The skirt and hat are fabulous. I love the top, also. Thanks Ada! I hope you are having a fantastic week! 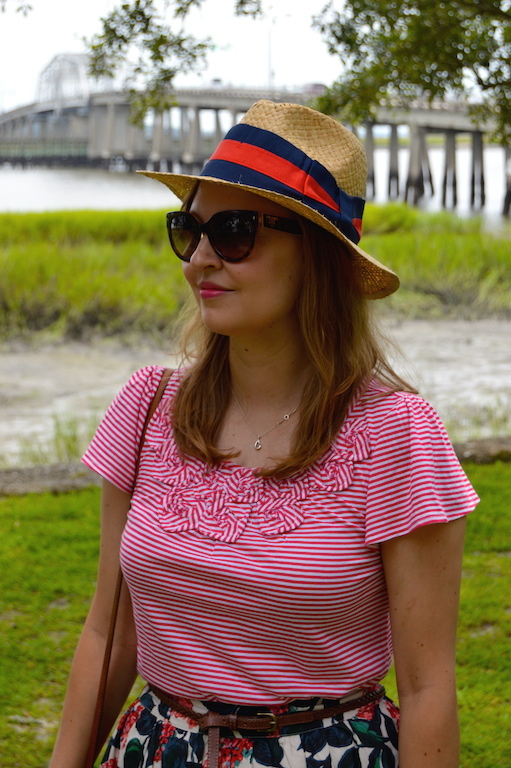 I never, ever wear hats, but I fell in love with this one and wore it throughout the trip. Now I am addicted to hats! Also, I would love to be your stylist! What a fun job for those who are able to make a living picking out what people wear! I hope you are having a great week too! lovely hat & skirt mix! Love that bold stripe. Thank you Marie! 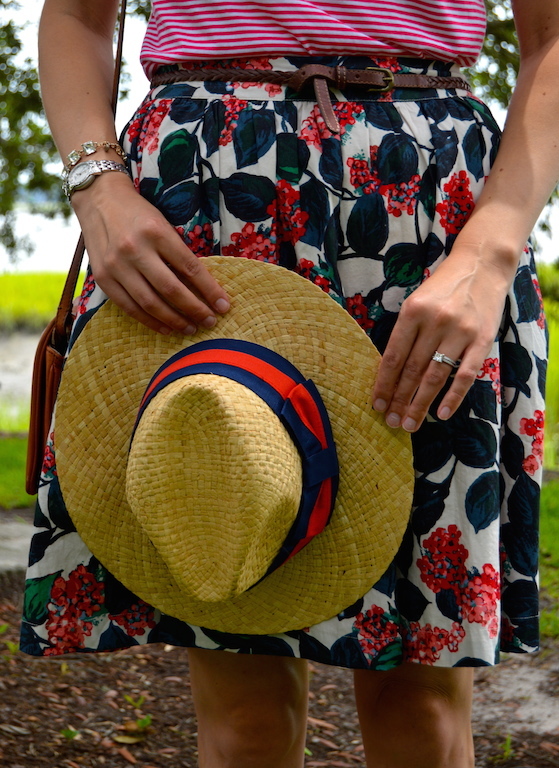 The skirt I packed for my trip just happened to be the perfect compliment to the hat I picked up! This outfit is perfect for hot summer days. Yes, I agree the outfit is perfect for summer, although it didn't really help too much in keeping me cool! Love the pattern mixing and the hat! Yes, photo sessions only last a couple of minutes in the South before you melt. Melting is the perfect choice of word to use for how the weather makes you feel! So pretty Katie, love the skirt and the embellishment of the top. I have been to Beauford, and am a Southern girl of 11 years being in NC. I agree with the opressive heat, whew, it is a challenge and I often wonder why I bother curling my hair for photos. I do love historic homes and all of the things you mentioned too. YOu look lovely!! Thank you Jessica! My grandma lived in NC for a while and I remember how humid it was there too. I actually think I would enjoy living in the South if it were not for the weather!